Welcome to Our Online Training Site. Within the pages and publications of our site you'll learn everything you need to know to launch a successful career as a Firefighter. Chief Paul Lepore’s publications are the nation’s best-selling books for those pursuing a career in firefighting. Are you looking to prepare for the interview and want personal private interview coaching? 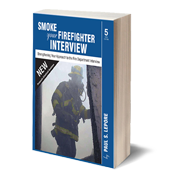 The FREE downloads section will help prepare you to become the candidate that all fire departments are looking to hire. 85 of the most commonly asked questions, with complete answers and the reasoning behind them.